If you're looking for a hard-working tomahawk that's easy to carry and perfect for throwing, then the Cold Steel Frontier Hawk 90FH is a great choice. The Frontier Hawk is 22 inches long, while the hawk blade itself is 6 inches in width. The primary edge is 3 1/4 inches; a sturdy back screw keeps the blade securely attached. The handle is American hickory and the steel is drop forged 1055 carbon, meaning that the blade is tough enough to handle almost anything you throw at it (or throw it at!). Made from a mixture of carbon and manganese, 1055 carbon steel has staying power and holds a sharp edge. Weighing in at approximately 23 ounces, this 'hawk is heavy enough to get the job done, but not so heavy you'll get too tired carrying it. If you want to throw this tomahawk, you can hit your target hard without worrying about having trouble retrieving it afterwards. The Frontier Hawk is perfect for re-enacting scenes from the American Wild West, as a camping tool, or even a throwing contest. Take it with you on a hike or out in the bush and watch how it performs under pressure! This is a tough tactical outdoor tool that won't let you down. Whether it;s an historic re-enactment, personal use, or chopping you're way through the great outdoors, you'll find the Cold Steel Frontier Hawk 90FH to be a great choice for whenever and wherever you need it. Do you own or have you used the Cold Steel Frontier Hawk 90FH? If so, rate it! Carbon steel is one of the most common choices for the weapon market. It is less susceptible to corrosion, so it lasts longer, and is also easy to sharpen. As carbon steel is harder than stainless steel, it is able to have a more acute edge without the risk of bending during contact with hard materials. 1055 Carbon Steel is commonly used for edged weapons, like swords, machetes, tomahawks, and knives. It is heat-tempered in order to reduce the possibility of breakage. There are only two components to Carbon Steel: Carbon (content being between .50% to .60%) and Manganese (content between .60% to .90%). Depending on the exact carbon content, 1055 Carbon steel has a quenched hardness of HRC 60-64, due to the use of lean alloy and the high carbon content. When quenched, 1055 carbon steel produces a nearly saturated lathe martensite that does not contain the brittleness common of other high carbon metals. 1055 Carbon Steel that has been drop forged means the carbon steel has been forged using a process in which a hammer is raised and then "dropped" in order to deform the steel into the shape of the die. This can be done with an open die, where the die does not enclose the metal being shaped, or with a closed die, where the metal is enclosed, leading to different shapes of completed materials. Manufacturers who want a long lasting and durable blade often choose drop forged 1055 carbon steel, the result being blades of almost unmatched toughness for axes, hatchets, tomahawks, and other steel weaponry. American Hickory (Carya juglandacae) is a deciduous hardwood tree, indigenous to the North American East Coast and Midwest. The name hickory came into the English language in 1618 from pawcohiccora, the Algonquian word for a food made of pounded nuts and water. Native Americans used hickories for dye and valued them for their strong, hard wood. The wood has been used for hundreds of years in the United States for tools and products and is still used very often today. Hickory wood was so tough, the expression came to mean something or someone unyielding. President Andrew Jackson was called "Old Hickory" because he was considered such a tough fighter. When hickory was brought to Europe, it was used for walking sticks and golf clubs. In 1826 club manufacturer Robert Forgan of Scotland began to use hickory for club shafts. It quickly became the wood of choice for golfers the world over. By 1900 baseball bat manufacturers were using hickory wood in the United States for bats that were sometimes called hickories. American hickory is still used to day in the production of many tools, weapons and sports equipment and is especially useful for handles because of its combination of stiffness and durability and shock absorption. The history of the California-based company Cold Steel dates back to 1980. Now known as Cold Steel, Incorporated, the company made a name for itself by focusing on the newest innovations in the field. It was one of the first companies that used tanto point blades in its production line, and those blades are now an industry standard. Cold Steel also introduced customers to Kraton handles, which fit better and more comfortably in the hand. These innovations and others helped the company grow from a small American company to one that sells products around the world. Cold Steel has its headquarters in Venture, California, and while it has a showroom that is open to the public, it also sells its products through authorized dealers and retailers. Lynn C. Thompson, who founded the company, now serves as its President, while Ron Balicki and Robert Vaughn hold key roles in the corporation. Many people know the company because it is one of the few weapons manufacturers that still create products in the United States. Customers can also find products made in Japan, China, South Africa and Taiwan. Products from Cold Steel include folding knives, walking sticks, blowguns, swords, knives, tomahawks and machetes. The tanto, which is a knife that slips inside an included sheath, existed long before the company began making the knives, but many believe that if it weren't for Cold Steel, American shoppers couldn't find those products today. Cold Steel is also responsible for a large number of martial arts products sold in the United States. Cold Steel also has a special projects division that sells weaponry and products unrelated to its main line, and it runs the American Tomahawk Company, which creates many of the tomahawks sold in the country. Military personnel use some of the knives and weaponry created by the company, and those at home can purchase the same products. 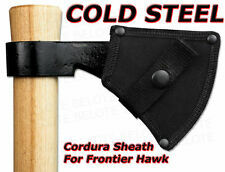 Have you or someone you know purchased or used the Cold Steel Frontier Hawk 90FH? How did it work? Share with the community! I was looking for a light weight camping axe and this one was perfect. The head is easily removed to put in pack. It cuts wood like nobody's business. I was surprised to see it chops better than my bigger more expensive axes. This is a great little camping-backpacking axe. Get one, but a word of caution. If you plan on throwing it, make sure you have a couple of spare handles sitting around.